This is a writing/ science lesson. I completed this with my grade 6 science class. Students made chocolate covered pretzels to explore solids/ liquids, physical change, and how adding heat/ taking away heat changes the form of chocolate. 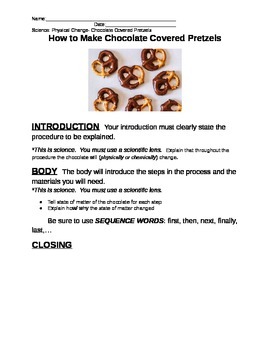 Students drew pictures, completed a graphic organizer, and wrote a how to writing piece (using a science lens). The completed organizer and a word bank were used to support students.